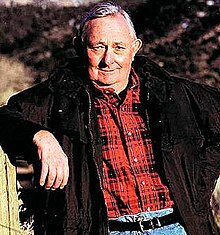 Anthony Grove "Tony" Hillerman (May 27, 1925 – October 26, 2008) was an American author of detective novels and non-fiction works best known for his Navajo Tribal Police mystery novels. Several of his works have been adapted as theatrical and television movies. 1974 Edgar Award for Best Novel. Special Friends of the Dineh Award. Tony Hillerman was born in Sacred Heart, Oklahoma to August Alfred Hillerman, a farmer and shopkeeper, and his wife, Lucy Grove. He was the youngest of their three children, and the second son. His paternal grandparents were born in Germany, and his maternal grandparents were born in England. He grew up in Pottawatomie County, Oklahoma, attending elementary and high school with Potawatomie children. He was a decorated combat veteran of World War II, serving from August 1943 to October 1945. He served as a mortar-man in the 103rd Infantry Division. He earned the Silver Star, the Bronze Star, and a Purple Heart. He attended the University of Oklahoma after the war, meeting Marie Unzner, a student in microbiology. The couple wed and have one biological child and five adopted children. From 1948–62, he worked as a journalist, moving to Santa Fe, New Mexico in 1952. In 1966, he moved his family to Albuquerque, where he earned a master's degree from the University of New Mexico. It was during his time as a writer for the Borger News-Herald in Borger, Texas that he became acquainted with the sheriff of Hutchinson County, the man upon whom he would pattern the main character in his Joe Leaphorn novels. He taught journalism from 1966 to 1987 at the University of New Mexico in Albuquerque, and also began writing novels. He lived there with his wife Marie until his death in 2008. At the time of his death, they had been married 60 years and had ten grandchildren. A consistently bestselling author, he was ranked as New Mexico's 22nd wealthiest man in 1996. He wrote 18 books in his Navajo series. He wrote more than 30 books total, among them a memoir and books about the Southwest, its beauty and its history. His literary honors were awarded for his Navajo books. Hillerman's books have been translated into eight languages, among them Danish and Japanese. Hillerman's writing is noted for the cultural details he provides about his subjects: Hopi, Zuni, European-American, federal agents, and especially Navajo Tribal Police. His works in nonfiction and in fiction reflect his appreciation of the natural wonders of the American Southwest and his appreciation of its people, particularly the Navajo. His mystery novels are set in the Four Corners area of New Mexico and Arizona, sometimes reaching into Colorado and Utah, with occasional forays to the big cities of Washington, D.C., Los Angeles and New York City. The protagonists are Joe Leaphorn and Jim Chee of the Navajo tribal police. Lt. Leaphorn was introduced in Hillerman's first novel, The Blessing Way (1970). Sgt. Jim Chee was introduced in the fourth novel, People of Darkness. The two first work together in the seventh novel, Skinwalkers, considered his breakout novel, with a distinct increase in sales with the two police officers working together. Hillerman repeatedly acknowledged his debt to an earlier series of mystery novels written by the British-born Australian author Arthur W. Upfield and set among tribal aborigines in remote desert regions of tropical and subtropical Australia. The Upfield novels began to be published in 1928 and featured a half-European, half-aboriginal Australian hero, Detective-inspector Napoleon (Bony) Bonaparte. Bony worked with deep understanding of tribal traditions. The character was based on the achievements of an aborigine known as Tracker Leon, whom Upfield had met during his years in the Australian bush. Hillerman discussed his debt to Upfield in many interviews and in his introduction to the posthumous 1984 reprint of Upfield's A Royal Abduction. In the introduction, he described the appeal of the descriptions in Upfield's crime novels. It was descriptions both of the harsh outback areas and of "the people who somehow survived upon them" that lured him. "When my own Jim Chee of the Navajo Tribal Police unravels a mystery because he understands the ways of his people, when he reads the signs in the sandy bottom of a reservation arroyo, he is walking in the tracks Bony made 50 years ago." He also mentioned Eric Ambler, Graham Greene and Raymond Chandler as authors who influenced him as he wrote the Leaphorn and Chee novels. Tony Hillerman died on October 26, 2008, of pulmonary failure in Albuquerque at the age of 83. In an interview published in Le Monde, Hillerman said his Navajo name means "He who is afraid of his horse." His novels were popular in France. Hillerman credits that popularity both to French curiosity about other cultures and to his translator, Pierre Bondil. The Tony Hillerman Library in Albuquerque, named in his honor. Hillerman is considered one of New Mexico's foremost novelists. In Albuquerque, the Tony Hillerman Library was dedicated in 2008, and the Tony Hillerman Middle School (part of Volcano Vista High School) opened in 2009. Dance Hall of the Dead, published in 1973 earned Hillerman the Grand Prix de Littérature Policière in 1987, a French international literary honor. Hillerman was awarded an Honorary Doctorate of Literature (Litt.D.) from the University of New Mexico in 1990. He was awarded the Owen Wister Award in 2008 for "Outstanding Contributions to the American West." Hillerman was a decorated combat veteran of World War II; he earned the Silver Star, the Bronze Star, and a Purple Heart as a mortarman in the 103rd Infantry Division. He won and was nominated for numerous awards for his writing and his work with other writers. His first nomination came in 1972, with his novel The Fly on the Wall being nominated for an Edgar Award in the "Best Mystery Novel" category. Two years later his novel Dance Hall of the Dead, second book in the Leaphorn-Chee series, won the 1974 Edgar Award for Best Novel. He was again nominated for the "Best Mystery Novel" Edgar Award in 1979 for Listening Woman and lastly in 1989 for A Thief of Time. Hillerman's non-fictional work Talking Mysteries was nominated in 1992 for the Edgar Award in the "Best Critical or Biographical" category. In 1987, Hillerman received the Grand Prix de Littérature Policière for Dance Hall of the Dead. In 1991, Hillerman received the MWA's Grand Master Award. Hillerman received the Nero Award for Coyote Waits and the Navajo Tribe's Special Friends of the Dineh Award. Hillerman has also been successful at the annual Anthony Awards. His novel Skinwalkers won the 1988 Anthony Award for "Best Novel" and in the following year A Thief of Time was nominated for the 1989 Anthony Award in the same category. His next nomination was for his Talking Mysteries non-fictional work which was nominated at the 1992 Anthony Awards. His novel Sacred Clowns received a "Best Novel" nomination at the 1994 Anthony Awards; and the following year his short-story collection The Mysterious West won the 1995 Anthony Award in the "Best Anthology/Short Story Collection" category. His last win came at the 2002 Anthony Awards at which he won the "Best Non-fiction/Critical Work" award for his memoir Seldom Disappointed. Two of the Navajo Police novels won The Spur award, given by the Western Writers of America annually. Skinwalkers won the award in 1987 for Western Novel, and The Shape Shifter won in 2007 for Best Western Short Novel. Seldom Disappointed: A Memoir won the Agatha Award in 2001. Hillerman's novels were recognized at the Macavity Awards. A Thief of Time won the "Best Novel" award in 1989 and Talking Mysteries won the "Best Critical/Biographical" award in 1992. Seldom Disappointed also received a nomination in the "Best Biographical/Critical Mystery Work" category in 2002. He received the Parris Award in 1995 by Southwest Writer's Workshop for his outstanding service to other writers. In 2002, Hillerman received the Agatha Malice Domestic Award for Lifetime Achievement, given by Malice Domestic for mystery novels in the spirit of Agatha Christie. In 2013, Hillerman's daughter, Anne Hillerman published the first new novel since 2006 featuring Hillerman's Navajo Police characters, Spider Woman's Daughter (ISBN 0062270486); the novel's protagonist is Jim Chee's wife, Officer Bernadette Manuelito. Her second book Rock With Wings (ISBN 0062270516) was released in 2015. Song of the Lion (ISBN 0062391909), her third book, was released in 2017. Anne's fourth novel, Cave of Bones (ISBN 0062391925), was released in 2018. The first appearance of Jim Chee in the Leaphorn-Chee series is in People of Darkness. In these three books, Joe Leaphorn is only briefly mentioned once, as "Captain Leaphorn at the Chinle substation" (POD, ch. 6). In the later books, where he is again prominent along with Jim Chee, he is "Lieutenant Leaphorn." Expanded Third Edition (2011); ISBN 978-1-60781-137-4. ^ a b c "Best Mystery Novel Edgar Award Winners and Nominees - Complete Lists". Mysterynet.com. Retrieved March 7, 2012. ^ a b c Haynes, Elizabeth (2011). Crime Writers: A Research Guide. Santa Barbara, California: ABC-CLIO, LLC. p. 75. ISBN 978-1-59158-914-3. ^ a b c d Stasio, Marilyn (October 27, 2008). "Tony Hillerman, Novelist, Dies at 83". The New York Times. Retrieved October 29, 2010. ^ a b c d e Stead, Deborah (16 August 1988). "Tony Hillerman's Cross-Cultural Mystery Novels". New York Times. Retrieved 2 May 2016. ^ a b Holley, Joe. "Tony Hillerman, 83; Penned Navajo Series". The Washington Post. Retrieved May 25, 2010. ^ "Skinwalkers" (January 1, 1986 ed.). Kirkus Reviews. April 4, 2012. Retrieved November 22, 2014. Here, however, Hillerman brings together his two series characters--middle-aged, cynical Lieut. Joe Leaphorn and young, mystical Officer Jim Chee--without in any way diminishing the stark power and somber integrity that have distinguished previous exploits of the Navajo Tribal Police. ^ Upfield, Arthur (1984). A Royal Abduction (first American ed.). Miami, Florida: Dennis McMillan. pp. v–vii. ^ deHoog, Kees; Hetherington, Carol, eds. (2011). "Upfield: The Man Who Started It". Investigating Arthur Upfield: A Centenary Collection of Critical Essays. Cambridge Scholars Publishing. p. 29. ISBN 978-1443834957. ^ Ulysse (May 1, 2006). "Les Navajos m'appellent Celui qui a peur de son cheval" ["The Navajo call me one who is afraid of his horse"]. Le Monde. Retrieved April 1, 2015. ^ Ulysse (May 1, 2006). "Les Navajos m'appellent Celui qui a peur de son cheval" (in French). Le Monde. Retrieved April 1, 2015. ^ Roberts, Susan A.; Roberts, Calvin A. (1998). A History of New Mexico. Albuquerque, NM: University of New Mexico Press. p. 383. ISBN 0-8263-1792-8. ^ "Tony Hillerman Library". Abclibrary.org. Albuquerque/Bernalillo County Library System. 2014. Retrieved January 28, 2014. ^ Piper, Ann (2014). Education in Albuquerque. Charleston, SC: Arcadia Publishing. p. 112. ISBN 9781467131032. ^ Office of the University Secretary. "Honorary Degrees". The University of New Mexico. Retrieved March 25, 2018. ^ "The Owen Wister Award". Western Writers of America. Retrieved April 28, 2015. ^ "Best Critical or Biographical Edgar Award Winners and Nominees - Complete Lists". Mysterynet.com. Retrieved March 7, 2012. ^ "The Nero Award List Alphabetic (Author's Last Name)". The Wolfe Pack. October 20, 2013. Retrieved July 24, 2014. ^ a b c d "Bouchercon World Mystery Convention: Anthony Awards Nominees". Bouchercon.info. October 2, 2003. Retrieved March 7, 2012. ^ "Winners of the Spur award, 1954 - 2015". Western Writers of America. Retrieved April 28, 2015. ^ "Past Agatha Award Winners & Nominees". Gaithersburg, Maryland: Malice Domestic, Ltd. Archived from the original on April 12, 2010. Retrieved July 24, 2014. ^ a b "Mystery Readers International's Macavity Awards". Mysteryreaders.org. Retrieved March 7, 2012. ^ "Parris Award 1987 to 2010". Parris Afton Bonds. 2014. Retrieved July 24, 2014. ^ "A Brief History of Malice: All Past Honorees". Gaithersburg, Maryland: Malice Domestic, Ltd. 2014. Archived from the original on October 5, 2015. Retrieved July 24, 2014. ^ a b c "American Mystery! Specials". WGBH. 2003. Retrieved 16 April 2014.